History of neglect and casualness in respect of SCs and STs over the last many years across different Governments continues in the Budget 2018-19. The goal of liberating the SCs and STs from their basic vulnerabilities has not been kept in view in this Budget as in the previous Budgets of different Governments. 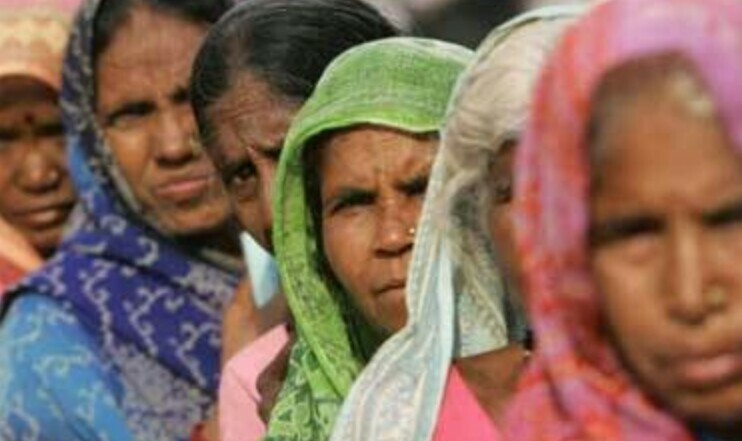 The goal of Equality, which is the Constitutional right of SCs and STs, i.e., enabling SCs and STs to reach the level of Equality, i.e., Equality with Socially Advanced Castes (SACs), i.e, non-SC, non-ST, non-SEdBC castes (NSCTBCs) in all parameters of development, welfare and life, has been neglected in this Budget as in the past Budgets across different Governments; though it is the Constitutionally-mandated duty of the State to promote Equality as above. Schemes of importance for the liberation of SCs and STs from their vulnerabilities such as a massive national programme of distribution of Government and Bhoodan lands to every rural SC family and, along with them, to ST and other rural landless agricultural labour families, through a centrally-funded Task Force for every Tehsil/Taluq/Mandal of the country with Group Minor Irrigation for all lands of the SCs and STs, have not found place in this Budget also, despite its centrality for SCs and STs and despite its manifold and far-reaching cascading beneficial effects for the country's economy and society which I have repeatedly pointed out to successive Governments including the present Government, and despite the President of Indias solemn commitment to the nation in his Address to the joint session of the Parliament in 2004. The provision of Ekalavya school in every Block where tribals constitute majority population and which have not less than 20,000 tribal residents is welcome for the educational advancement of STs the outlay for this is not found in the Budget and needs to be provided. But the provision of a scheme of residential schools, one for SC boys and one for SC girls, in each Block of the country, as recommended by the Group of Ministers on Dalit Affairs under the Chairmanship of Shri Pranab Mukherjee in 2008, has been again ignored. Other schemes for educational equalization of SCs and STs have also been ignored. Arrears of Post-Matric Scholarships to the tune of Rs. 11000 Crores, as I have pointed out to the Finance Minister vide my e-letter to him dated 9.9.2016 and in my pre-Budget letter to the Finance Minister dated 31.12.2017, has not been provided for either in the RE 2017-18 or in the BE 2018-19. Such accumulation of arrears is contrary to the basic feature of this scheme, that is open-ended, which means whatever amounts are required for any number of SC and ST Post-Matric students shall be released in time and formalized in the subsequent RE. Breach of this condition and accumulation of arrears has resulted in a large number of SC and ST students being forced out of the institutions for non-payment of fees. Measures for prevention of loss of tribal lands and restoration to STs of lands previously lost continue to be missing. Gross deficit continues in the provision of adequate allocations, not less than the population-proportion of SCs and STs, for SCP and TsP, essential for securing the objectives mentioned above and schemes such as those mentioned above. 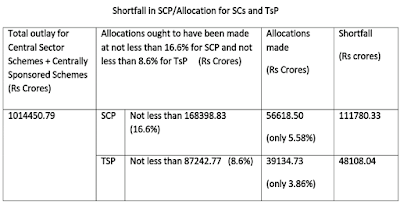 Correct methodology of provision of SCP/allocations for SCs and TsP/allocations for STs continues to be evaded, viz., setting apart the share of SCs and STs as an untied corpus and undertaking within this corpus such schemes which will enable the SCs, STs to reach the level of Equality as explained above and be liberated from their basic vulnerabilities. 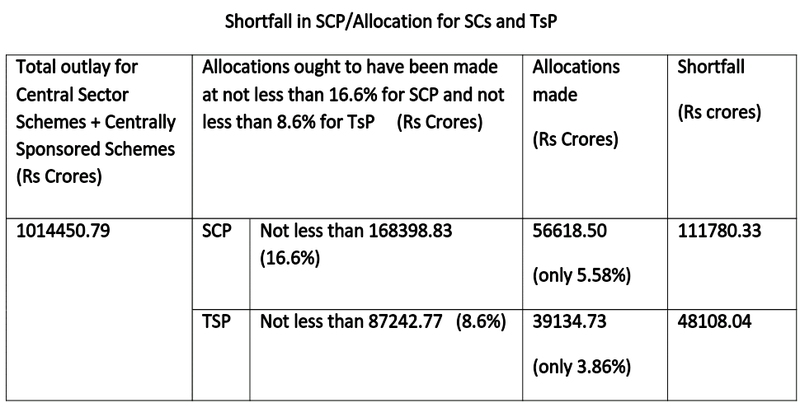 * the outlay for TsP/allocations for welfare of STs at not less than 8.6% ought to be not less than Rs 87247.77 crores, but only Rs 39134.73 crores (3.86% instead of 8.6%) has been provided. Even these provisions for SCP/TsP do not follow the correct methodology of including in SCP/TsP only outlays for schemes/programmes which exclusively benefit SC and ST individuals, families, households, habitations and institutions etc. and which will enable them to reach Equality as explained above and be liberated from their basic vulnerabilities, and instead is a result of arithmetical-statistical jugglery as in the past. Print and electronic media, with their focus on matters like personal income tax and return of long-term capital gains, have ignored these vital aspects of the Budget pertaining to the SCs and STs; such stray and casual remarks as some of them have made are superficial and misleading.